Speed Date Book Review: The Year of Yes. Shonda Rhimes. The megatalented creator ofGrey’s Anatomy, Scandal and executive producer of How to Get Away with Murder chronicles how saying yes for one year changed her life – and how it can change yours, too. With three hit shows on television and three children at home, the ubertalented Shonda Rhimes had lots of good reasons to say no when an unexpected invitation arrived. Hollywood party? No. Speaking engagement? No. Media appearances? No. And there was the side benefit of saying no for an introvert like Shonda: nothing new to fear. Then Shonda’s sister laid down a challenge: Just for one year, try to say yes to the unexpected invitations that come your way. Shonda reluctantly agreed – and the result was nothing short of transformative. 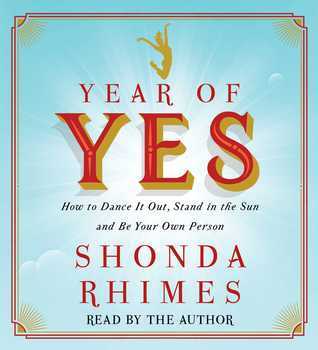 In Year of Yes, Shonda Rhimes chronicles the powerful impact saying yes had on every aspect of her life – and how we can all change our lives with one little word. Yes. I listened through this in less than a week, which is a little unheard of for me and an audiobook. I think any introvert is going to identify and enjoy this book, and let’s be honest many of us are. The blurb tells you what it is about and really that’s it. Shonda Rhimes speaks honestly, I am sure she brings her writer embellishments to it, her sense of drama, her timing. I really enjoyed listening to her, and I don’t think I would have enjoyed it as much just reading it. A couple of her speeches are included – and they are live. You hear the audience. The part that I liked the most – her growth into her sense of who she is and speaking her truth. In her year of yes there is room for her yes to no. No to what she is not. I sure liked that bit. I came away feeling enriched by her sharing – and a renewed interest in her TV shows!